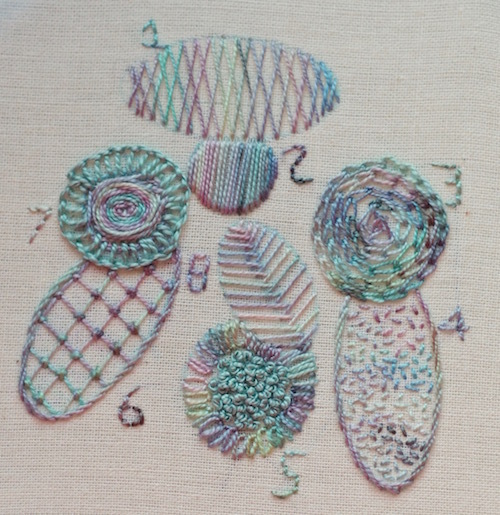 To help you learn hand embroidery stitches we are going to look at filling in shapes.. Previously I suggested some ideas for embroidering lines.. I drew some circles and ovals onto my fabric with a pencil, overlapping some of them. I then proceeded to use a variety of stitches to fill these shapes. The thread used is Fine Cotton from Oliver Twists, and a little Pearl Cotton no. 8 for contrast. working the "line" across the whole width of an area (shapes 1 and 8). Just because you are stitching an area totally enclosed by a line, you don't have to hide the fabric entirely. Mixing some solid sections with others that have a "lighter" treatment, can introduce exciting contrast into your project. The next photograph shows 4 different diaper patterns, a term used for repeating elements within a space. Whether arranged in horizontal/vertical rows, diagonally or randomly, these mini motifs produce an attractive effect. The threads used here were no. 12 cotton pearl and 2 strands of DMC Light Effects. 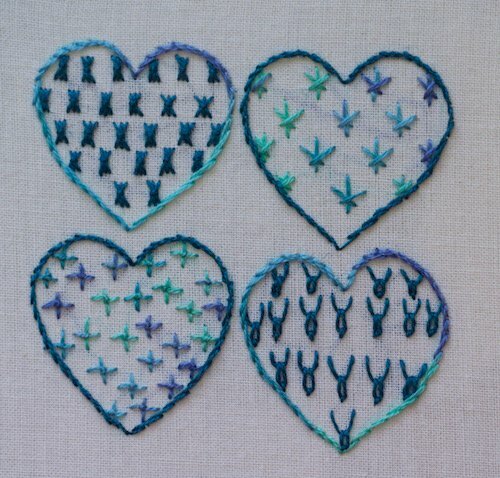 Each heart is outlined in stem stitch. I will describe how to work each of these fillings below. Many people learn hand embroidery stitches without ever discovering this little treasure! It is really easy to work, consisting of a group of three straight stitches set side-by-side. The needle is then brought up in the center and threaded under the left hand stitch. After taking the thread around the "sheaf" it is then tucked underneath the right hand stitch and to the back of the fabric. Pull firmly enough to draw the long stitches together in the center. Another simple combination, - a long vertical stitch, then two crossing it diagonally. 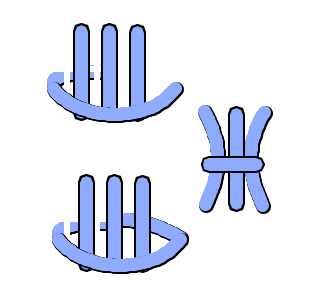 The arms of the diagonal stitches extend further to the sides at the top than they do at the bottom, and they sit towards the bottom two thirds of the vertical thread. If you have ever eaten at a French restaurant you will recognize the word boeuf, as a translation of beef. This motif is so named as it is meant to represent the two horns and head of a bull. It is worked with a combination of a fly stitch and a detached chain. 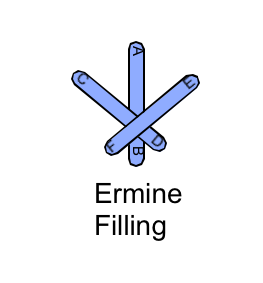 I have only ever seen this used as a filling. Try not to pull it too tight or you will loose the effect. 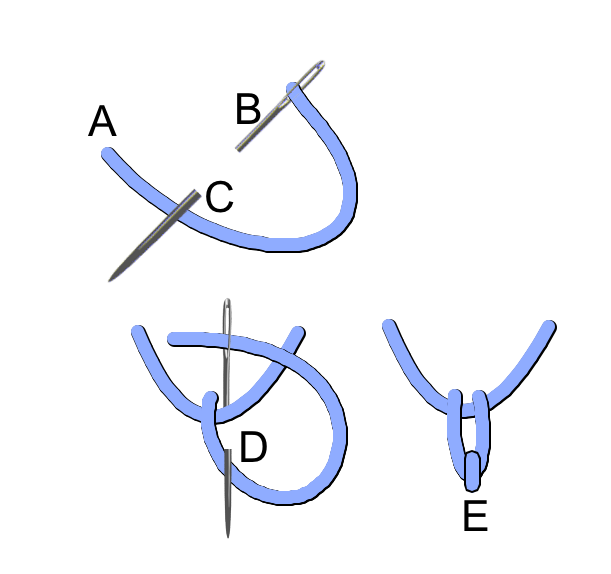 Take a vertical stitch then bring the needle out to the right side as if you were going to make an upright cross. Insert the needle just to the right of the first arm and up in the same movement, over to the left. Tuck the working thread under the needle and pull it through the fabric. 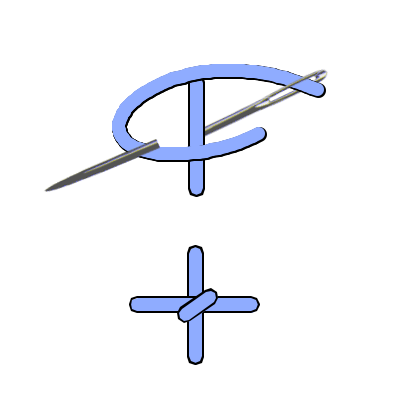 Maneuver the thread so that it comes out of the middle of the cross, then secure the knot by taking the needle down fractionally below and to the left of the center. I hope you have enjoyed this page and will continue to learn hand embroidery stitches with me by visiting other pages on the site.